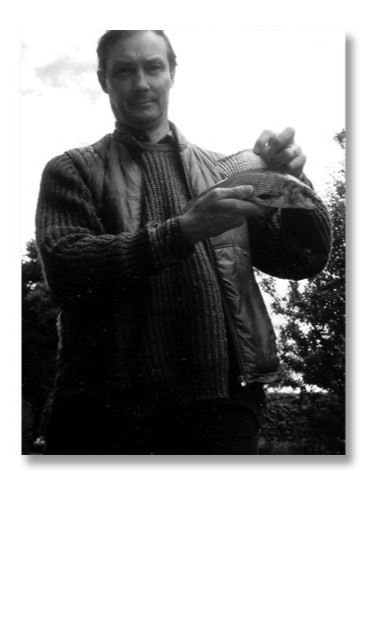 As a boy, Chris Knowles was encouraged by his grandfather and father in the pursuit of coarse fishing – for tench in a moat in Woolwich Arsenal and for roach, dace, perch and minnows in the river Darenth and at Tenterden. Chris started fly fishing relatively late in life, having ignored the opportunities offered him on a plate, when he lived for some years in a house with a garden which backed on to the Avon, and for several summers when he was dragged up to Jura for sea-trout fishing. Many years later, he took up fly fishing on the Hertfordshire Mimram just minutes away from his home and his office, as an antidote to the fashionable affliction of stress and, after a virtually blank first season, decided that he'd better learn about this fishing business pdq. The relaxing hobby became an obsessive passion (though none the less relaxing for that), which soon encompassed book collecting, as well as fly tying. Chris writes about his passion for fly fishing in his latest book, Orange Otter. It tells the story of the Reverend Powell of Munslow, Shropshire, who in 1949 had more listings in A Dictionary of Trout Flies than any other name except for Pritt and Ronalds. With the help of sixty years of Powell’s fishing diaries, he acquaints us with the man behind the patterns and at the same time reveals a whole era of fishing theory and practice that was in danger of disappearing from view. In so doing, he creates a fascinating, highly readable, portrait of Welsh Border fishing and its main characters. He has contributed a number of articles to the Fly-dresser, the journal of the Fly-dressers Guild, of which he is a member and was a branch programme secretary. Much of his professional life is spent in the world’s opera houses and concert halls, now on the audience side of the curtain. In his musical life, he has contributed to Groves’ Dictionary of Opera and the millennium edition of the National Dictionary of Biography, for which sins he was elected a member of the Savage Club, whose past members include Walter Gallichan (who appears in the pages of this book) and William Senior (one-time editor of The Field). For the last five years, he has regularly fished the Ithon, with its bankside memories of Eagles and Powell. He is married to an opera singer. Together they have three boys, none of whom yet shares his father’s enthusiasm for trout and grayling, though they often inquire about the edibility of chub!